With more than 20 million streams of their eighth studio recording I'll Be Your Girl, The Decemberists release their acclaimed B-sides EP, Traveling On. The EP consists of 4 tracks from the IBYG boxset Exploded Edition now released digitally for first time along with a full band version of "Traveling On" from I'll Be your Girl. For more than 17 years The Decemberists have reigned highly acclaimed, with more than 200 million streams and 1.8 million adjusted albums spanning worldwide. 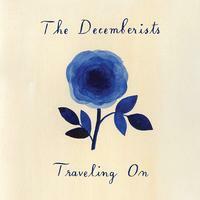 The Decemberists continue a tradition of releasing a post LP B-sides EP, with Traveling On, previous releases include Picaresqueties (2005), Connect Sets (2006), Long Live The King (2011) and Florasongs (2015).